Scientists have found what they believe are traces of the lost Indonesian civilization of Tambora, which was wiped out in 1815 by the biggest volcanic eruption in recorded history. Guided by ground-penetrating radar, U.S. and Indonesian researchers recently dug in a gully where locals had found ceramics and bones. 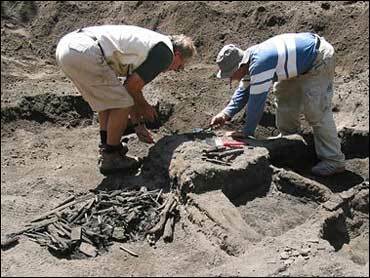 They unearthed the remains of a thatch house, pottery, bronze and the carbonized bones of two people, all in a layer of sediment dating to the eruption. The eruption shot 400 million tons of sulfuric gases into the atmosphere, causing global cooling and creating what historians call "The Year Without a Summer." Farms in Maine suffered crop-killing frosts in June, July and August. In France and Germany, grape and corn crops died, or the harvests were delayed. The civilization on Sumbawa Island has intrigued researchers ever since Dutch and British explorers visited in the early 1800s and were surprised to hear a language that did not sound like any other spoken in Indonesia, Sigurdsson said. Some scholars believe the language more closely resembled those spoken in Indochina. But not long after Westerners first encountered Tambora, the society was destroyed. "The explosion wiped out the language. That's how big it was," Sigurdsson said. "But we're trying to get these people to speak again, by digging." Some of what the researchers found may suggest Tambora's inhabitants came from Indochina or had commercial ties with the region, Sigurdsson said. For example, ceramic pottery uncovered during the dig resembles that common to Vietnam. John Miksic, an archaeologist at the National University of Singapore, has seen video of the dig and said he believes Sigurdsson's team did find a dwelling destroyed by the eruption. But he doubts the Tamborans were from Indochina or spoke a language from that area. If Vietnamese-style ceramics reached the island, it was probably through trade with intermediaries, Miksic said. During the dig, Sigurdsson's team found the charred skeleton of a woman who was most likely in her kitchen. A metal machete and a melted glass bottle lay nearby. The remains of another person were found just outside what was probably the front door. The team included researchers from the University of North Carolina and the Indonesian Directorate of Volcanology.